Midsummer is a great time to discover the Blue Ridge Restaurant in Glover Park which has been open now for about 2 months. We had lunch on a beautiful sunny day and indulged in two summertime favorites: deviled eggs and a BLT. Chef Barton Seaver walks the sustainable food line serving locally grown produce, game and seafood with a twist. In my case, the Just-Like-Grandma’s deviled eggs were placed on top of a swirl of pesto, while my BLT came layered with fried green tomatoes. Both were delish and left me craving a return trip. 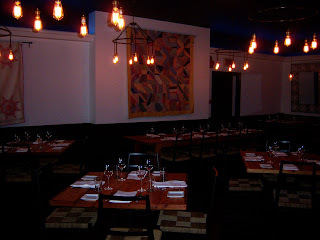 The restaurant is separated into four parts: the well appointed neighborhood bar, the dining room (below) decorated with Amish quilts, the upstairs which is not open yet; but would be great for a private function, and the patio (above) which reminds us of the spaces we see in Austin. We’ll go back to Blue Ridge for their quality take on comfort food. 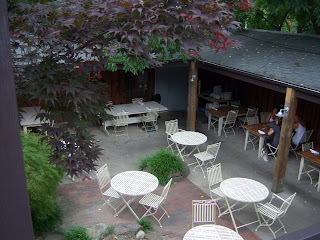 Plus, the patio would be a perfect spot to share brunch with our girlfriends on a lazy Sunday.